Minor scanner tweaks and optimization. Added 5 more settings, making a total of 10 settings. Very minor fix in the Female Others preset. 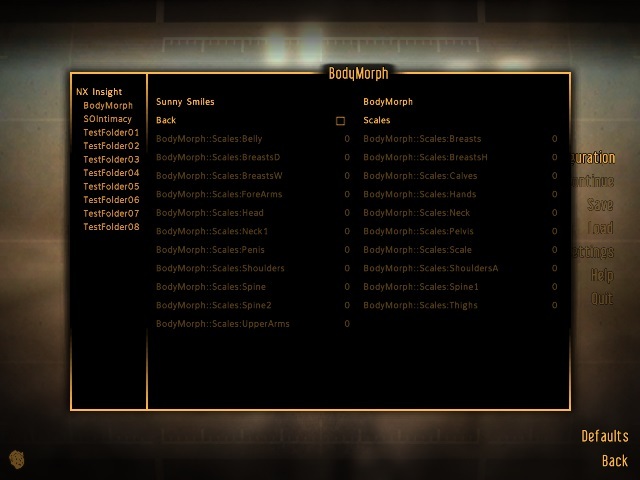 Increased required BodyMorph version to 1.1.0. Rewritten code is more robust. 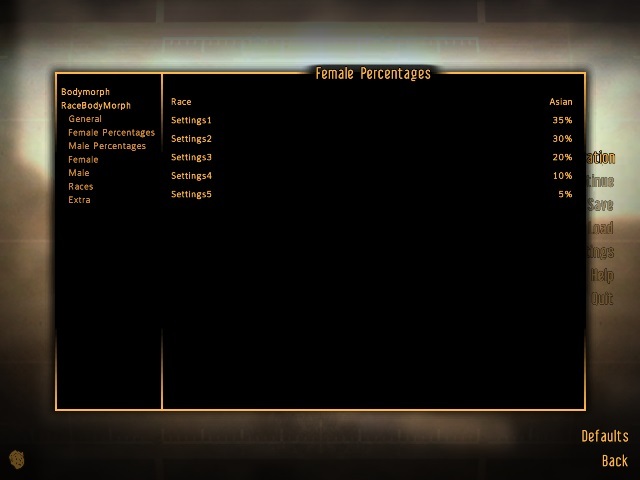 Each race per gender now has their own percentage weights on which settings will be used. Use NX variables as flags instead of tokens. This completely frees the mod from the AddItem bug and equipment re-evaluation. Dead Cleanup has been removed as it is now handled by the core. Added Ctrl+M hotkey for quick access to Activation Menu. 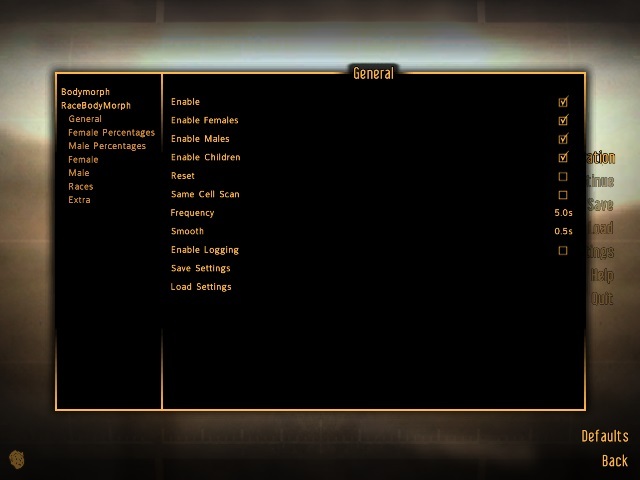 Merged both Female and Male settings into one MCM menu. Now creates a settings ini in the Data/Config directory for editing slider limits to easily accommodate future changes to the core mod without updating. Added GetInSameCell check on the scanner instead of the previously removed GetInGrid. Removed GetInGrid check from the scanner. Now uses a dummy armor for the AddItem bug workaround instead of leather armor that should prevent removal of NPCs' leather armor when resetted. Fixed dead cleanup not working. Minor script modifications and optimizations. More foolproofing on the scanner. Minor modifications on the scanner. Changed default scanner smoothness from 0.05 to 0.5. Unsetted biped slots of tokens. Tokens shouldn't be equipped anymore. 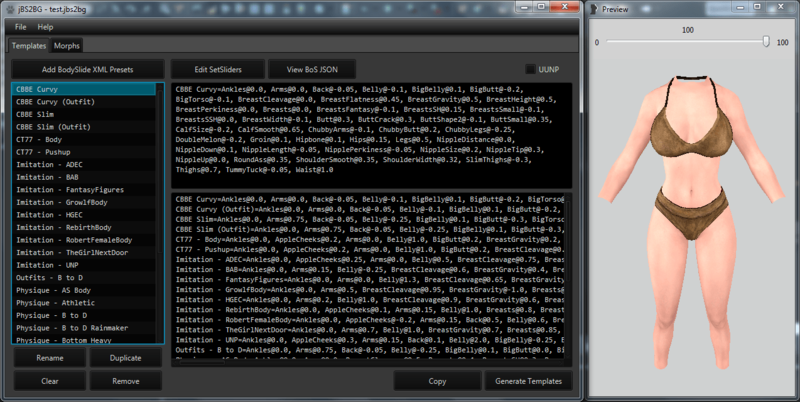 Rewritten and improved scanner script. Added 2 more slots for saving settings, making a total of 3 slots. Modified script for race determination. Will now check if a race name contains the name of a base race. 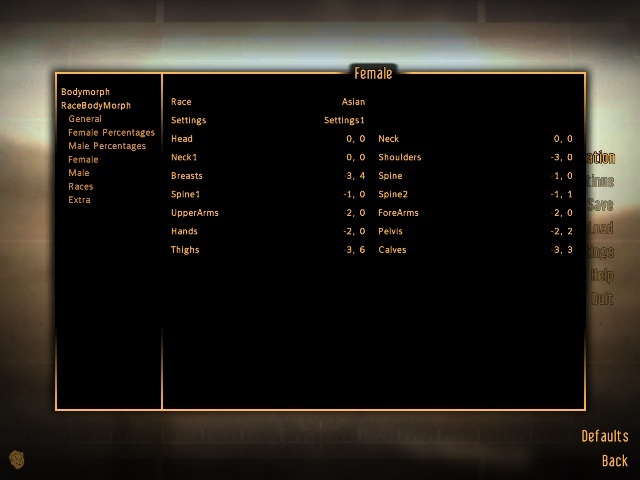 For example, a custom race with the name "Custom Asian" will now be processed under the "Asian" category instead of "Others". This makes proper support for DLC races. Added "Others" category for custom races. Added settings for toggling races. Refactored a lot of variables. Replaced the misc token with an unplayable armor item to make it invisible from inventory. Added cleanup for bodymorph data of dead actors. This should keep the size of the nvse cosave file down. Finally fixed the unresponsive combat bug. It is caused by the AddItem function's bug that causes the weapons of the NPCs to become unusable. Will now ignore actors that are alerted, alarmed or in combat and actors that are within the same cell and are hostile towards the player. Reset function will now only reset actors that are enabled in the menu. Fixed children not resetting. Forgot to remove a flag. Use ScaleUp and ScaleDown instead of ScaleAbs. Forgot a bone in the reset script. Fixed.